Power issues will disrupt the flow of energy to your mission-critical equipment, crippling your facility and the equipment it supports. So what are the nine power anomalies that you must watch out for, and how can you protect your facility from them? 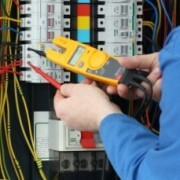 It doesn’t always take a significant power disruption to cause an impact to your facility. While a complete loss of utility power is obviously harmful, even a slight sag or spike in voltage can also have significant effects if you haven’t invested in the proper protection. That’s why installing proper surge suppression and UPS system is so important. With the right UPS system for your facility, you can protect your equipment from most, if not all, of the following nine power anomalies. 1. Power failure – A total loss of utility power. 2. Power sag – A short term low voltage. 3. Power surge (spike) – A short term high voltage above 110 percent normal voltage. 4. Under-voltage (brownout) – Reduced line voltage for an extended period of a few minutes to a few days. This often happens during the summer months when people set their air conditioners higher than normal. 5. Over-voltage – An extended period of increased line voltage for a few minutes up to a few days. 6. Electrical line noise – A high frequency waveform caused by radio frequency interference (RFI) or electromagnetic interference (EMI). 7. Frequency variation – A change in frequency stability of 50 or 60 Hz. 8. Switching transient – Instantaneous undervoltage measured in nanoseconds. 9. Harmonic distortion – The distortion of a normal power wave, generally transmitted by nonlinear loads. The best way to protect yourself against power anomalies is to invest in a UPS system. Each of the following four systems is designed in a different way and likewise provides a different level of protection. *Line-interactive – These UPS systems monitor incoming voltage from the utility. If a power loss or anomaly is detected, the system will boost or decrease utility power by either allowing it to pass directly to your equipment or by running on battery power. This model is ideal for applications where the utility power is fairly clean. If you’d like to afford reliability to your home or small-office computer, a line-interactive system is an appropriate choice. *Standby – These systems allow equipment to run straight on utility power. If the UPS detects an outage or disruption in utility power, it will automatically switch to battery power, providing protection against sags, surges or outages. We recommend this model for non-critical applications that require simple backup, such as small office and home office appliances as well as point-of-sale equipment. *Ferroresonant – This model operates similarly to a line-interactive model, with one exception: A ferroresonant transformer provides some power conditioning and isolation at output and may store energy long enough to continue providing power while the system switches from line power to battery power. Most ferroresonant systems are between 82 and 88 percent efficient and provide excellent isolation. These units are primarily used in industrial settings, such as the oil and gas, petrochemical, chemical, utility and heavy industry markets. *Online double-conversion – If you want the highest level of protection for your facility, an online double-conversion UPS system is the best option. These UPS systems isolate the equipment from raw utility power by converting power from AC (alternating current) to DC (direct current) and then back to AC, which then powers your equipment. An online UPS topology is the only unit that supplies power without transfer time to the battery, providing protection for even the most sensitive equipment. Additionally, it’s the only system with the capacity to provide protection from each of the nine power anomalies. The system design also includes an internal static bypass, ensuring that your critical loads will switch back to utility should your UPS experience a catastrophic failure or require repair. If your equipment is mission critical or if your facility is located in an area with poor power conditions, QPS always recommends an online double-conversion system. All it takes is one of the nine power anomalies to put your entire facility at risk, as well as the load it supports. By choosing the right UPS system for your application needs, you can grant yourself the proper protection from whichever power anomalies threaten you or your facility. Ferroresonant was new to me. I must say its capabilities are quite the protection you should be integrating with your system. In the Philippines, power outages are widely experienced due to insufficient supply of power and this kind surely is a must have.